Waffle House is supporting employees who called police on a black woman. In a heated meeting with protesters Monday, Waffle House officials doubled down on supporting employees at one of the company's Alabama franchises who called the police on an African-American patron out of "concern for their personal safety." 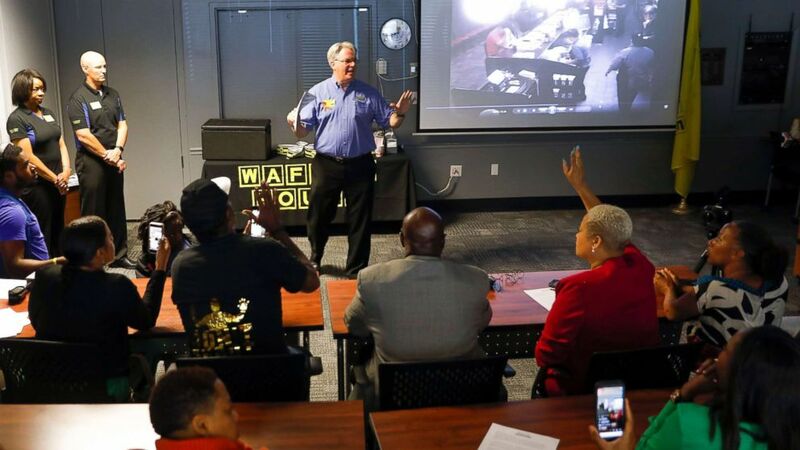 Waffle House officials invited civil rights advocates, including an official from the local NAACP chapter, into its headquarters near Atlanta to show them unedited security video of events leading up to the April 22 arrest of Chikesia Clemons at a Waffle House in Saraland, Alabama. 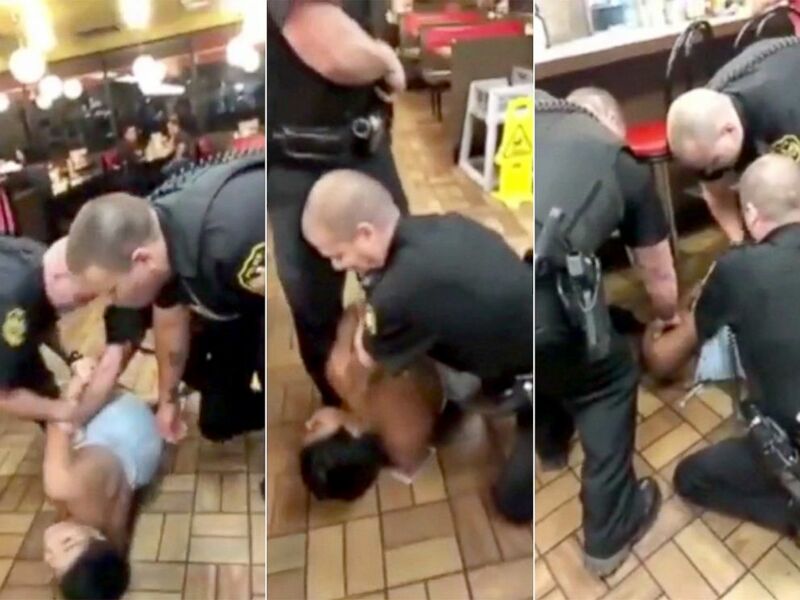 (Canita Adams/Storyful) Chikesia "KiKi" Clemons, 25, was wrestled to the ground by two uniformed police officers after allegedly refusing to pay extra for plastic utensils, April 22, 2018, at an Alabama Waffle House. The arrest of the 25-year-old woman sparked outrage and calls for a nationwide Waffle House boycott after a cellphone video surfaced showing three white male Saraland police officers wrestling Clemons to the floor of the restaurant and handcuffing her even as the top of her shoulderless dress came down, exposing her breasts. Clemons' stepfather, Lamar Howard, told ABC News that Waffle House staff called the police on Clemons after she refused to pay 50 cents for plastic utensils and asked for a phone number for the company's corporate office to register a complaint. "She's owed an apology, just like the two men in the Starbucks," Howard said, referring to Rashon Nelson and Donte Robinson who witnesses said were arrested and paraded out of a Philadelphia Starbucks in handcuffs earlier this month after the manager called police because she said the men refused to place an order or leave. The men say they were awaiting a business meeting. Starbucks officials have apologized to Nelson and Robinson and said police should have never been called. The charges were dropped against the two men. The coffee giant has since said it will shut down all 8,000 of its company-owned U.S. stores on the afternoon of May 29 to train more than 170,000 workers on implicit bias and how to avoid racial discrimination. The Waffle House statement released today says its workers did the right thing by calling the police on Clemons. "Witnesses say several threats were made to our associates including threats of violence, and that's why the police were called," a Waffle House statement reads. The statement continues: "It has also been reported that the customer made reference to a gun and using that gun. Our primary concern is always for the safety of our customers and our associates. We train our associates to contact local law enforcement anytime there is any concern about their personal safety or that of our customers." Waffle House spokesman Pat Warner handed out the statement before playing for the activists the security video, which did not include sound. (Erik S. Lesser/EPA via Shutterstock) Activists meet with a Waffle House representative at the restaurant chain's corporate headquarters in Norcross, Ga., April 30, 2018. Protesters on hand to see the video represented the Alliance for Black Lives, the Gwinnett County NAACP and Street Peace America. After seeing the video, the activists said they believed unjustified force was used by the police officers on Clemons and that nothing she did in the video appeared to warrant police intervention. "When I saw the video, it was very inhumanely done," Penny Poole, a member of the Gwinnett County NAACP, told reporters of Clemons' arrest. Dre Propst of Alliance for Black Lives demanded that police drop disorderly conduct and resisting arrests charges filed against Clemons and that the officers who arrested Clemons be charged with assault. Activists are also asking that audio of the incident be released, saying that shows Clemons was threatened by the officers. Meanwhile, Jacinda Mitchell, another African-American woman, posted a video on Facebook that she claims shows she was locked out of a Waffle House in Pinson, Alabama, while white customers were being served inside. "We are aware of the incident at our restaurant in Pinson, Alabama on April 22, 2018. We have launched an investigation to gather all of the facts," Waffle House said in a statement. "Waffle House is a welcoming place for everyone, and we are fortunate to enjoy a very diverse and loyal customer base who we do our best to serve every day. The employee involved should not have locked the front door at all and should have certainly opened the door for the customer when she arrived. We will get the facts and take appropriate action quickly." 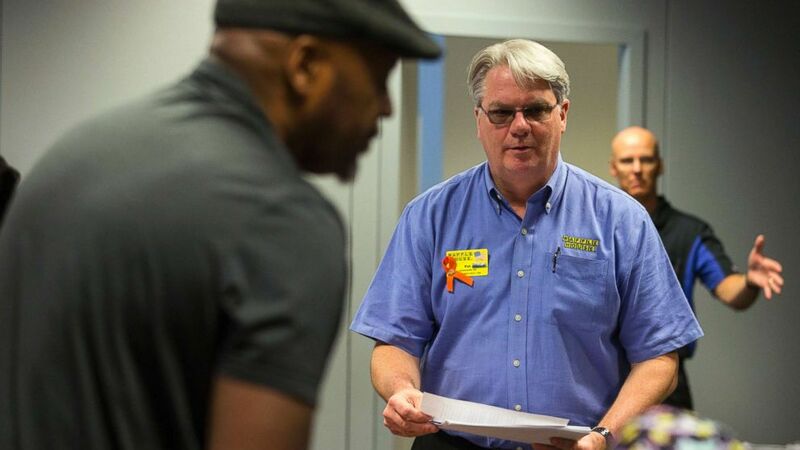 (Alyssa Pointer/Atlanta Journal-Constitution via AP) Waffle House spokesperson Pat Warner passes out a statement to protesters during an impromptu press conference at the Waffle House corporate campus headquarters in Norcross, Ga., April 30, 2018. The Rev. Al Sharpton, a New York civil rights activist, is scheduled to hold a town hall meeting in Mobile, Alabama, on Tuesday night on the two Waffle House incidents. Sharpton is expected to be joined at the town hall by Clemons and her attorney Benjamin Crump. Last week, the Saraland Police Department held a lengthy news conference on Clemons' arrests in which they defended the actions of the police. Det. Brian Mims said witnesses claimed Clemons and a friend entered the restaurant and that one of them had an alcoholic beverage and were told they could not bring in outside food or beverages into the eatery. After that encounter, the situation escalated with both Clemons and her friend "being loud and using profanity toward the employees of Waffle House," Mims said. He said the women threatened the employees with physical violence and, according to witnesses, one said, "I can come back and shoot this place up if I need to." The incident occurred on the same day a gunman killed four people at a Waffle House near Nashville, Tennessee. "Witnesses also report that the officer asked Ms. Clemons to comply with his instructions on multiple occasions to stop resisting arrest and she refused to comply," Mims said. Police said only Clemons was arrested because she refused orders to leave. "During the interview, one of the employees said the conversation of the plastic utensils did come up," Mims said. "The employee did convey the message that ... it is now customary that if you ask for plastic utensils to dine in only that there is a 50 cent charge. When they had a discussion about it between the patrons and the staff, they did provide the utensils before they took their order and they were not going to be charged for it." J.C. West, public safety director of the Saraland Police Department, ruled that no discipline would be required for the officers who arrested Clemons. "Public Safety Director West and other members of staff have reviewed the video numerous times. They have looked at it from every angle and they have listened to what the witnesses have said and they are not choosing to take any action at this time," Mims said.